Make sure this fits by entering your model number. ; DSLR Camera and Mirrorless Backpack Bag by Altura Photo for Camera and Lens (The Wanderer Series); Exterior Dimensions: 12" x 6.5" x 17" (LxWxH). 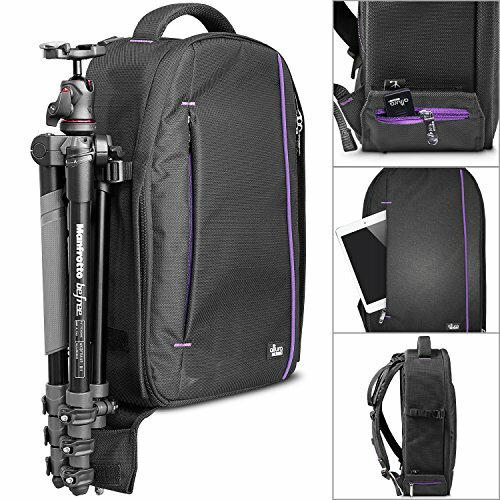 Holds and protects 1 DSLR with attached lens, 4-5 additional lenses, a shoe-mount flash, plus a tripod or monopod. ; Padded slip pocket under the lid for laptops up to 14-inches. 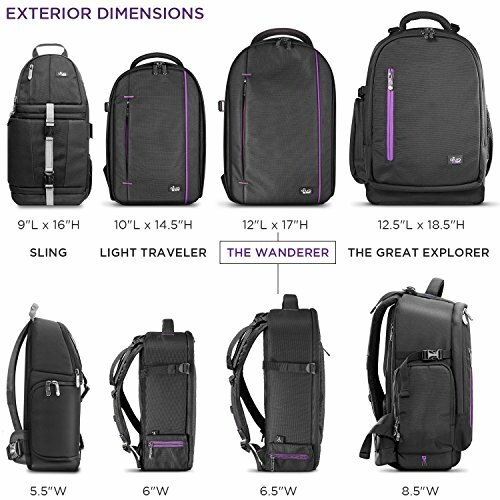 ; Made from durable weather resistant nylon with tough reinforced stitching for everyday carry. ; Backed with Digital Goja 90-Day 100% Satisfaction Guarantee. Great bag. I’ve been wearing it on my travels and it is very comfortable and easy to access on the fly. Divider system is not as well-designed as it could be but there is plenty of room for my camera and two lenses. And yes, it does fit with a 70-300mm lens attached to the camera! Very happy with this bag. It fits my Canon EOS 7D perfectly. In the photo I uploaded, it has the 50mm lense and the 28-135mm on the right. I also have extra accessories, such as my Speedlite 430EXII, located in the top pocket. 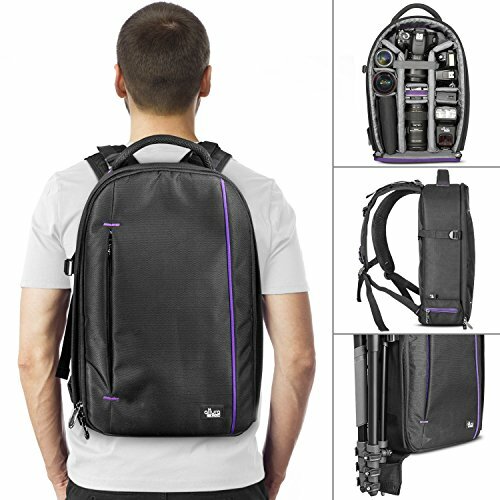 Just received this camera bag and after putting all my things it is I can say it is a Great camera sling backpack. Slinging it over my shoulder is easier for me to put on and I love it that you can pull it around the front of you and get into the main pocket with the camera in it.I can fit my Canon T5i with the 18-55mm lens on it and both the 300mm and 250mm lens in with the camera. In the netting pocket inside that area I have both spare battery and spare camera card in it. There is room left to tuck my charger in and take with me if I am going to use this for trips.In the area at the top of the backpack I have both my 50mm and 10-18mm lens in it. It is not too tight buy snug enough that they won’t be moving around banging into each other. The netting pockets inside this top area hold my remote controller, cleaning cloths and cleaning brush.I am pleased that as I pulled the sling backpack around to front that the main pocket opens to the side facing up, toward my face and I can get into it without fear of anything falling out. 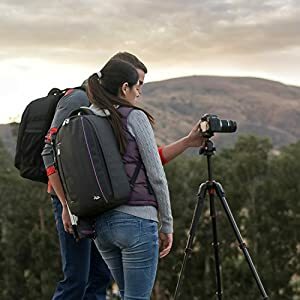 There is a latch across that pocket that you can unlatch and unzip all the way open if desired.I have a big tripod but it does fit, the bag has a small pocket for one leg of tripod to go into it and a strap to hold the tripod tight. I tried it and wouldn’t be worried at all to carry the tripod on the bag although I like using my mono pod better than a tripod. The mono pod fits very nicely also.This is a good quality bag. 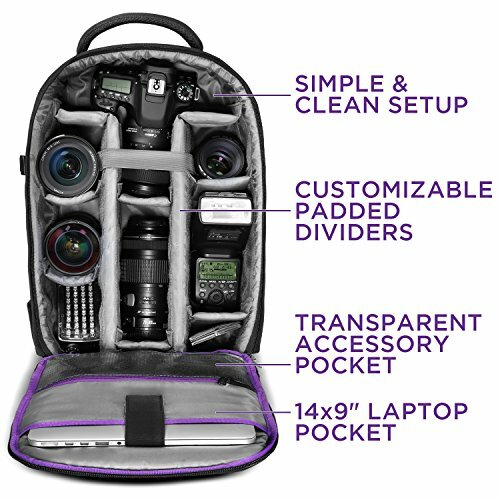 I have bought several bags for my camera but this one is going to be my favorite because of the space, ease of putting it on, carrying it.One thing I didn’t see when first ordering this was a picture of the extra strap that goes across the front of you. I can see where this would be a great help if you are hiking with this pack on as it levels out the pack and makes it more like a backpack and very secure. But if you have it snapped on, you can’t bring the backpack around to the front until you unsnap it. At least you have a choice.I highly recommend this bag. If you like carrying around a bunch of photography stuff and/or you have the more expensive FX lenses that tend to be bigger. This is probably not going to function as nicely as you like. I am one such photography and I love the design of the bag but it’s… inches too small. This would be a 10 star bag if just an extra inch was added in width and potentially length.Fantastic design. 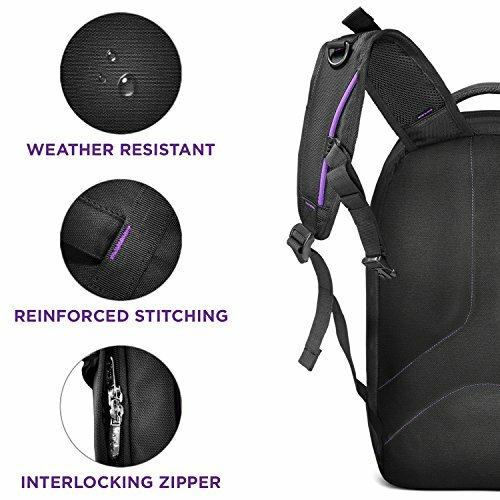 This thing works as a sling, swings around just like pictured and has buckles on the front to prevent camera items from falling out when you unzip it. But if you want easier access you just unbuckle them, no fuss, nice and simple.The strap for the bag is also great. The band is wide so even when I put heavy lenses in it the strap doesn’t dig into my shoulder. It also has a buckle for quick removal and an extra across your stomach for stability.For me, it’s slightly too small. I love the fact they kept is small but for what I want to use it for I am stuffing it a little too much…FLASHThis bag definitely can’t fit my flash… I am simply not comfortable with taking it out of it’s case to fold it oddly in the top like they show. I’d almost rather put an extra lens up there in a case than do that.LENS AND CAMERAIf you own a basic DSLR with DX lenses you will easily fit- Camera Body, stock lens (24-120mm), a 35 mm(or 55mm) and a small telephoto(70-200mm, 70-300mm gets slightly too long for standing tall as shown in picture)If you own a camera that uses FX lenses… Be prepared to stuff… you can get the body with a lens attached (not telephoto) and a smaller 35mm or 55mm lens but if you want to add a telephoto you have to start changing the way the camera sits inside the bag and personally I am a little weary of how protected the camera is at that point. I will say it fits but just not well.TRIPODThe side pocket would fit a small tripod as shown but I have yet to test how well the tripod really stays put and wears on your back like that. I am guessing it’s not going to be as nicely wearable as I hope. 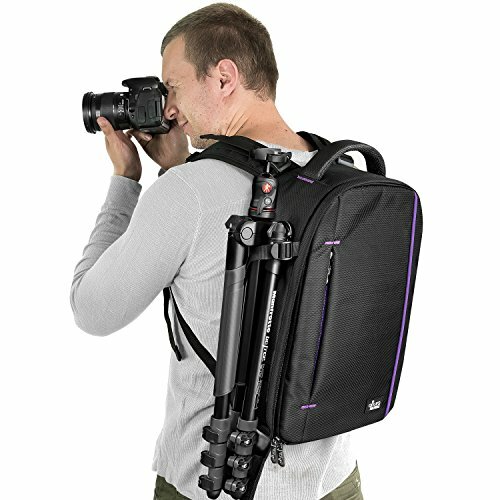 As far as a gorilla tripod, this would definitely sit there and travel just fine.LITTLE STUFFThere are several pockets for the little stuff. Extra battery, memory cards (strongly encourage a large case not individual memory card cases bc they will fall out, cleaning cloth, lens caps and so on. I do wish this had at least 1 zippered pocket but it doesn’t :(In shortPROS-Design, style, wearablity and comfort I give 10 stars out of 5 😀 Very very happy with this aspect of the bag.Easily fits smaller DX lenses and bodyLots of small pocketsLove the space for tripodCONSSlightly small if you are using FX lenses (ONE to TWO inches in width and depth would make this a perfect back for FX lenses as well! )Personally don’t feel it fits a flashWish one or two of the pockets zipped instead of velcroWith all that said, I’d buy it again. It’s functionality is so incredible that I just have to have it and will continue to work with it in hopes I find a better solution for the storage spacing of the lenses… good tetris practice. 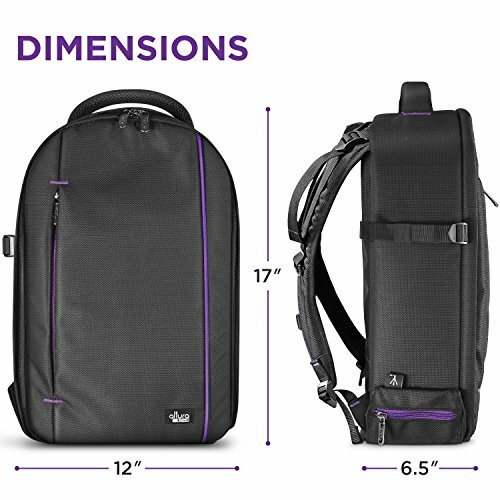 Holy smokes, this is an awesome bag for the money! I got the Wanderer and it fits all my gear perfectly, is fairly comfortable to wear with 15lbs of gear, and looks very streamlined to boot.I’m a 5’5″ female so I wanted something cute that would hold all my stuff and not overwhelm me; this fits the bill so perfectly that I have retired my $200 camera purse (which was a pain in the neck, literally! )Gear list:-Canon 5D-50mm, 85mm, 100mm, 28-130mm, 70-300mm lenses-flash-lightosphere-plus extra batteries, charger, cf cards, cf reader, folded reflector, and the front pocket is still empty to toss in my keys/wallet/cell phone.I seriously can’t recommend this enough!